Stains and spills are inevitable in the home. Someone’s eventually going to knock over a glass of milk and you’re going to want to know the best way to fix the damage quickly and efficiently. Erin Gates, author of ELEMENTS OF FAMILY STYLE, shares her 6 steps to defeating stains and spills. Spills and stains are inevitable when living with kids. It’s part of the fun—just embrace it! You can have as many “no raspberries in the living room” rules as you want, but accidents will happen. And some nonaccidents too, like when a certain child, who shall remain nameless, thinks it’s super fun to stomp Goldfish and blueberries into the carpet. And while you may have used durable fabrics and rugs all over the house, you may still need to attack those stains with all the firepower in your arsenal. #1. Treat Ahead of Time. Research local companies that come to your house and pretreat your upholstered pieces, rugs, and drapes with a stain repellent. We recommend this protective step to all our clients. Never rub a fresh stain as it will just push it deeper into the fabric and/or make the fabric pill. Use a white cloth to prevent any color transfer. You can use a small amount of dish soap mixed with water to treat, but always test first in an inconspicuous place like the bottom of a cushion. Use the hose attachment to vacuum the area and remove small particles or larger pieces of soil. Also note that a weekly vacuuming of your upholstery helps keep it in its best shape overall. If the area is still wet or the stain is particularly greasy, a wool-safe absorbent powder should be applied covering the affected/stained area. The powder should sit on the affected area for approximately five hours before it is vacuumed up. You can try cornstarch for a natural method. #5. Call in the pros. Sometimes you just will not be able to get a stain out, and in that case, call a professional cleaner to come treat it. It’s cheaper than having to buy new furniture or rugs. #6. Beware the nasty stuff. Bodily fluids from kids or pets (urine, vomit, etc.) are stains that are very hard to treat and often leave marks due to the high acid content, which can loosen dyes and fibers in the fabric or rug. These types of stains may be permanent on natural fibers. ***Thank you to MWI Fiber-Shield for the professional cleaning tips! 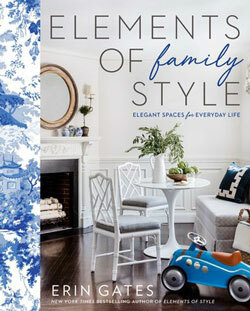 Find more advice on how to clean more efficiently in ELEMENTS OF FAMILY STYLE by Erin Gates! Excerpted from ELEMENTS OF FAMILY STYLE by Erin Gates. Copyright © 2019 by author. Used by permission of the publisher. All rights reserved. Loved by her readers for her chic interior designs and frank and funny revelations about life behind the scenes of her picture-perfect blog, bestselling author and designer Erin Gates presents a new book about how to live stylishly amidst the chaos of daily family life. Throughout her career designing homes for families of all kinds all over the country, Erin has always maintained that living with children and pets does not mean that you have to forego nice things. This uniquely personal and practical guide will explain how to create a home that makes you proud and reflects your own style while also being durable, safe, and comfortable for children. It focuses on the spaces families share, those that are dedicated to the kids, and the oft-forgotten retreats for parents. Erin T. Gates is a Boston-based interior designer, blogger, and curator of all things stylish. She began her blog, Elements of Style, in 2007 and formed her own design company, Erin Gates Design, shortly thereafter. Her work and writing have been featured in publications, such as O, The Oprah Magazine, Ladies Home Journal, House Beautiful, Boston Magazine, Inside Weddings, and Better Homes and Gardens. She is married to Andrew Gates and is mom to her two furry kids, Baxter and Oliver. They live in Boston.